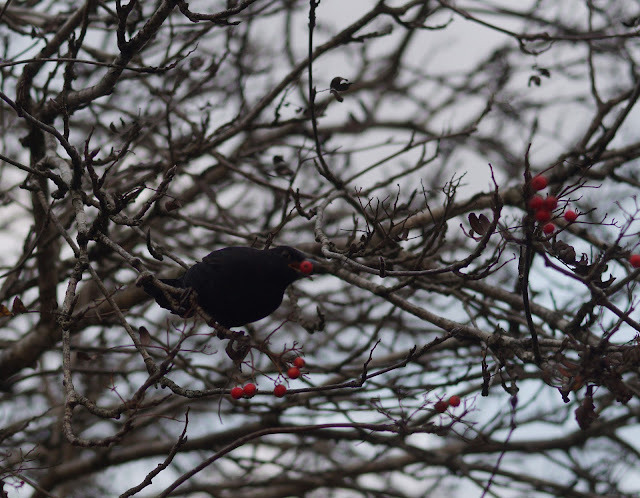 Can you imagine how pleased I was that Mr Blackbird was content to pick away at these vivid berries while I captured him on my camera. What a wonderful monochrome image with a bright pop of red. Mr Blackbird wasn't about to let a geek behind a lens spoil his party, he was going to plough on regardless. I'd like to think that my attitude lay long similar lines. I'm a 'get on with it' kinda gal. Crack on and just keep busy. Recent global events have threatened to bring everyone's mood down and let's be frank, they have, but there is no less joy to be found in the little things. In fact, I consider it the most worthwhile undertaking to take a deep breath and focus on routine and diversions. Unless something has gone catastrophically wrong the sun will rise each morning, bringing in light and warmth, the birds will chirp and sing, going about their daily lives, blissfully unaware of mankind's disarray. There is so much comfort to be found with immersion into the 'head down and carry on' way of thinking. So while it might seem frivolous even flippant at times to continue as if nothing has happened, I happen to consider it of paramount importance. Seize the day, squeeze all the productivity and joy out of it then do it all again tomorrow. Don't wait for better times to magically crop up, make it happen for yourself.